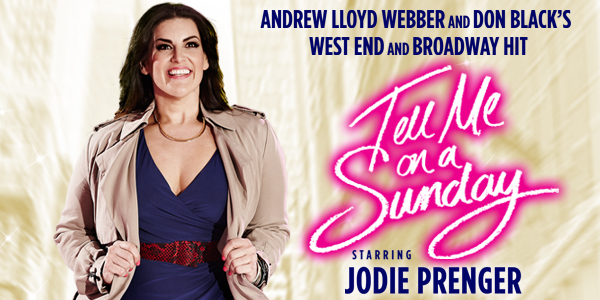 Following her acclaimed performance in the Watermill Theatre’s 2014 production of Calamity Jane, Jodie Prenger now steps into Andrew Lloyd Webber and Don Black’s classic musical, TELL ME ON A SUNDAY. Charting the romantic misadventures of an English girl in New York during the heady days of the 1980’s, this iconic musical features a wonderful original score including the chart-topping Take That Look Off Your Face. Performed by many legendary musical theatre stars including Marti Webb and Sarah Brightman, this new 2016 production directed by Paul Foster includes an intimate post-show chat with Jodie about life, love and playing the role of Emma. * A £1.50 per ticket booking fee applies, capped at six per order. Fee-free booking for Friends of Wycombe Swan; Groups of 10+ please call 01494 552875 to buy fee-free.